We value the arts and believe in the importance of music and visual art education. All student participate in music and art during a 9-week rotation each year. We seek to provide a learning environment that encourages creativity and welcomes inquiry, to expand cultural awareness and worldview of our students through music and the arts, and to cultivate a desire for all students to strive for excellence. Music and art classes offer the opportunity to pursue these goals. All PYP students study music four days a week for one quarter, culminating in a performance recital. Kids learn to sing songs and to perform in an Orff ensemble. Orff instruction focuses on a variety of percussion instruments, such as xylophones and glockenspiels. Students learn how to read and write music. They also explore world music and cultures on multiple continents, as well as how music interfaces with culture. Wesley instruction also incorporates Chinese and African drums into PYP music. All 6th-8th grade students participate in chorus one quarter each year. They learn about vocal technique and performance. Each 9-week session culminates in a recital. Wesley offers an MYP course focused on world music and cultures. Students learn about different musical styles throughout the globe and participate in research on different genres and instruments. Students prepare presentations to share their research with their peers. This General Music course explores music and floats of Brazil’s Carnival. Students also learn to read music. Students study visual art for 9-weeks each year. 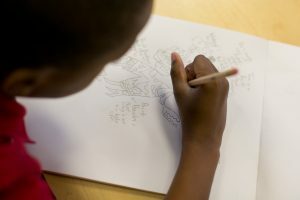 The instruction is differentiated for each age group, exploring topics like perspective, color, drawing technique, and more. Students create projects to experiment with new techniques and present to classmates.